Dog Eared Publicity is pleased to bring you Marja West's F'D WIDE OPEN Book Blast January 2 – 13! Now more than ever, Divine Love and Spiritual Awakening are essential to the survival of humanity. In this fast-paced world of techie-toys, instant messages, unconscionable greed, appalling indifference, and unspeakable violence, it is the Heart-Based New Humanity leading the way to conscious awareness. Ignoring life's intense ups and downs is no longer an option. 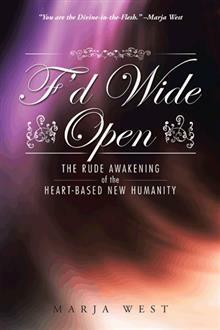 In F'd Wide Open, author Marja West explores the challenges of living life while developing Divine Love in our relationships and facing the horrors of today's world. She addresses the dark feelings, thoughts, and triggers we work so hard to ignore or deny. West provides a no-holds-barred boot camp, offering practical, no-nonsense advice and embodied, advanced spiritual wisdom of the highest order. This guide seeks to help you remember who and what you are: one of the grand creators and the free energy source of the Universe. You can reclaim the depths of your Divine Nature as a creator of reality and allow enlightenment to illuminate your path of evolutionary growth, change, and expansion. Invite the Divine to live in you; F'd Wide Open can show you how. Marja West is a non-guru lineage spiritual teacher, Way-Show-er, and Divine Love Agent Provocateur, mentoring today's men and women-the Heart-Based New Humanity-with practical tools to embody their realization of the truth of who and what they are: Infinite Loving Awareness and Consciousness having a human experience. Visit her online at www.MarjaWest.com. Marja is giving away a $25 Gift Card!